Another few days of silence from me have gone by, with an increasingly big stack of projects to work through. I decided, however, to break the publishing hiatus with reasonably breaking news. 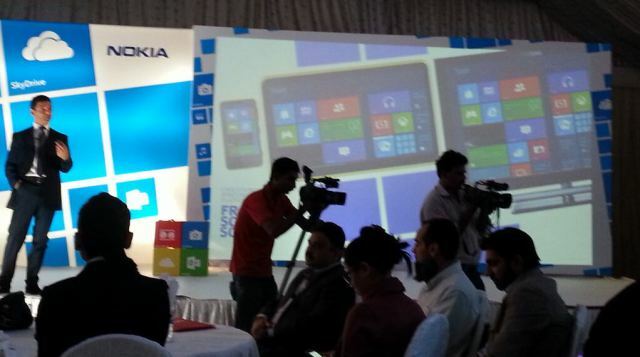 In Pakistan a launch event for the Lumia 620 had a rather snazzy, live tile filled, presentation that was being shown to the press. All of a sudden the image of a tablet appeared. It bears resemblance to the quirky little Lumia 620 in both shape and colour. With only under a fortnight to go until the start of MWC and Nokia’s press conference on the 25th, could this be an accidental/ careless revealing? Well, very possibly no! It turns out that all major technology websites got the wrong end of the stick. 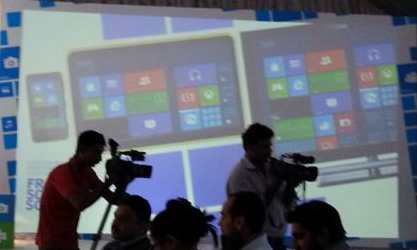 Apparently it is nothing more than a generic Microsoft slide and it was misinterpreted as a leak from Farhan who attended the Lumia 620 event. Here he explains the confuddlement: ‘Oops! I accidently didn’t leak the Lumia tablet’. My Nokia Blog contacted Nokia and got a reply that definitely puts this one to rest: ‘That’s not a leak. That is a picture that simply shows the Windows Phone UI, alongside the Windows 8 tablet UI, alongside the Xbox UI. They are not Nokia specific products.’ Well, all I can say is there is a reason why I made the Rumour Mill category on this website! Read on for the previous version of this post where I was entertaining the possibility that it was a Nokia tablet. The information is still relevant as Nokia might launch a tablet at MWC. You can clearly see that it is not an Android device, and most likely comes with Windows RT. There is a possibility that if it is powered by Intel it could come with the full Windows 8. If that image is true to life then it is not a Windows Phone device despite some commentaries on other websites. The tablet pictured looks to have a 7 inch screen. The other size that Stephen Elop and his team were considering was 10 inches. The tablet could sport that rumoured special case that envelopes the whole device whilst also carrying a secondary battery. From the pictures we can see the device has rounded corners, which I for one am happy to see, considering that sharp edges on such a large device would not be so ideal. It sports a vibrant yellow finish that makes it fit right into the exuberant Lumia crowd. As you can see the device fits with Nokia’s design paradigm and complements the Lumia 620. You should note that Nokia won’t necessarily launch a tablet at MWC. Stephen Elop has made it clear that Nokia is looking for the right time and space in the market. Let’s see if this month is the right time for them to announce it. Many websites have speculated whether this is a high end device or not. Just as many have made the point that a low end more compact tablet could really hit the sweet spot for many consumers. The Amazon Kindle was an example of just that. A Windows tablet with good hardware at a relatively low-end competitive price could set the market on fire. I’ll see you soon when I next post! Stay tuned for articles about BB10, what Nokia might announce at MWC, and a lot of up-and-coming collections. I am trying to escape just posting on news items, and I am getting ready for lots of editorials and even videos. Please show your support so I know I should continue making an effort. Thanks.